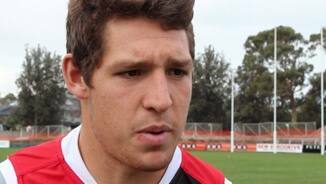 The six new faces at St Kilda Football Club have spoken to Saints TV. A strong marking forward with a penetrating right boot, Siposs was selected with pick 75 in the 2010 National Draft. Although he has spent time in defence and even on the wing in his time at the club, he seems settled as a third tall forward and will be intent on cementing a position in St Kilda’s best 22 in 2015. Arryn had shoulder surgery so he’s very much in that Tom Lee bracket, where he has to perform and get that base. Once he has that base of fitness and the right work ethic to compete, he will give himself every opportunity to compete. It’s a big pre-season for Arryn and there will be an opportunity for him if he gets his body right. A long-kicking, strong-marking half-forward with the ability to play as a wingman or running defender, Siposs was taken by St Kilda with pick No.75 in the 2010 AFL National Draft. Siposs’ 2013 season never quite fulfilled the promise of his 2012 campaign. After 11 matches in 2012, he began the year with a promising 19-disposal effort against Gold Coast before struggling with injury and consistency for the remainder of the campaign. 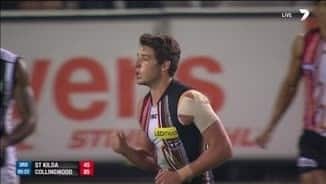 Five scoring shots against Collingwood in round six exemplified Siposs’ potential and with shoulder surgery behind him, he will be committed to re-establishing himself in 2014. His strengths are his versatility and booming right foot which can threaten the goals well outside the 50 metre arc. A skilful utility with a booming right foot, Siposs was recruited to St Kilda with pick number 75 in the 2010 AFL National Draft. He spent the vast majority of the 2012 season in the forward line, before moving to a back-flank for the last three games, exemplifying his versatility. Siposs is an excellent reader of the game whether he is positioned in front of behind the ball, and is another versatile option for Scott Watters ahead of the 2013 season. Arryn was recruited from the Dandenong Stingrays with pick #75 in the 2010 AFL National Draft. He is an exciting marking forward who is an excellent set shot on goal. Arryn made his debut in 2011, playing four consecutive games and impressing with 11 disposals and 2 goals in just his second game. Siposs has a long kick and became an instant fan favourite when he kicked a valuable goal late in his debut match against Carlton. Despite shin splints ending his 2011 season prematurely, Siposs worked hard in the gym over the pre-season, resisted surgery and made his way back into the side for the 2012 NAB Cup campaign. He was named as one of St Kilda’s best during the Round 1 NAB Cup games against Sydney and Geelong, and as a result, further strengthened his chances for senior selection this season. His first game in 2012 was the Saints Monday night clash against Carlton, coming in as a substitute. 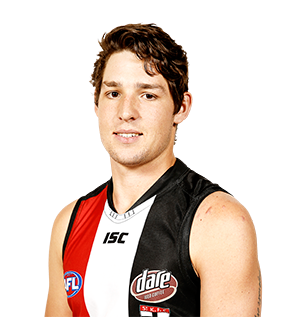 Even though he only played four games last year, the 19-year-old who has barracked for the Saints all his life, made enough of a statement to suggest he will be a long-term part of St Kilda’s plans.